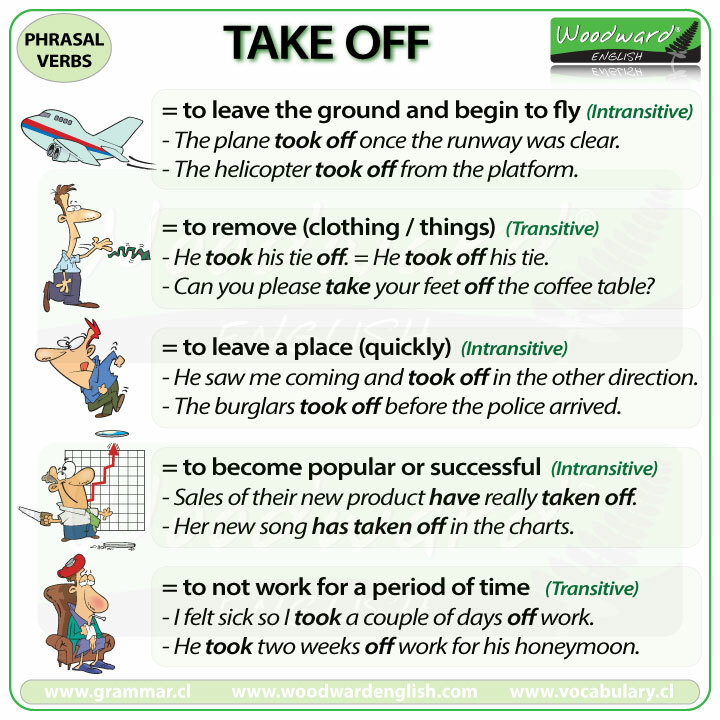 (intransitive) This phrasal verb is most commonly associated with planes (or aircraft) and how they become airborne. It can also be used when someone jumps and leaves the ground or when a bird or insects launches itself into the air. The plane was able to take off once the runway was clear. The plane had difficulty taking off due to the high winds. The helicopter took off from the platform. The noun form is take-off or takeoff. Due to the winds we didn’t have a smooth take-off. He took his hat off. Remember to take your shoes off before entering the house. To celebrate, the player took his shirt off and whirled it over his head. It was hot outside so I took off my coat. (intransitive – informal) This action is usually done in a hurry and often without the person saying where they are going. Sorry, but I have to take off now since my partner is waiting for me at the restaurant. The burglars took off before the police arrived. You won’t find Fred here, he has already taken off. She saw me coming and took off in the other direction. There is a similar meaning of leaving/departing a place, though not necessarily in a hurry. You can either leave a place permanently or for an extended period of time. It can be used when you set out on a journey. They wanted to live in a warmer climate so took off for Spain. (intransitive – informal) This phrasal verb is used when a person’s success or rise in popularity is sudden or very quick. It can also refer to when a (new) product has quickly had a lot of sales, especially compared to normal. That new song by Samantha Star has really taken off in the charts. After a couple of slow weeks, sales of the new Woodward Phone finally took off. (transitive) This can include being removed from a job, a position or a responsibility. The object is normally placed after the verb (except in Passive Voice). They took the injured player off the field on a stretcher. He sang so badly that they took him off the stage. The manager took her off the list. Due to his performance, he was taken off the team. The rescue helicopter took the crew off the sinking ship. The detective has been taken off the case. (transitive) This is to remove something from a place or the possession of a person. Quick! Take the knife off that little boy. Can you please take your feet off the coffee table? The last time I looked, your name had been taken off the list. The store has taken twenty percent off all of their products during the sale. If you pay in cash, we will take an additional ten dollars off the original price. (transitive) Used when referring to not going to work (or not doing a responsibility) for a period of time, usually for holiday/vacation, as a break or when a person is sick. The order is: Take + Time expression + off. I felt sick so I took a couple of days off work. He took four days off work to go hiking. I took last week off and now I have so much work to do. (transitive) This removal can be intentional, in this case mostly referring to the removal of hair, but it can also refer to unintentional removal due to an accident. The land mine took off both of his legs and he was very lucky to survive. I’m glad you took that moustache off. He had to take off his artificial arm every night before getting into bed. (transitive – informal) This phrasal verb is used when someone copies another person’s voice or mannerisms, especially in an amusing way.